From the 10th of April, the Museum of Contemporary Art presents the solo exhibition one of China’s most prominent contemporary artists, Zhang LinHai. MoCA will be showcasing 15 pieces of his most impressive works within his sandbox series. Born in Shanghai in 1963, Zhang Linhai had a troubled childhood. Abandoned in an orphanage as a baby, he was adopted by a poor rural couple at the age of one, and was relocated to an impoverished village near the Tai Hang Mountains. Though taken into a loving family, Zhang LinHai suffered from numerous illnesses as a child, including polio, which left him crippled. This disability meant he was unable to contribute to his family through the conventional means of farm work, rendering him useless within the framework of rural life. Thus art became his liberation. Encountering a legion of setbacks, and defying all odds set against him as an indigent farmer’s son, Zhang LinHai finally graduated from TianJin Academy of Fine Arts in 1990. Since then he has gone on to be one of China’s most highly regarded painters, converting the bitter irony of his life into the genius of his art. Zhang LinHai’s work delicately tiptoes the line between realism and surrealism, to produce a potent narrative that captures the turbulence of the Cultural Revolution in China. Directly inspired by the tragedy of his childhoods, the poverty he grew up in, and the physical disability that he endured, his artwork creates an illusionary world through which he finds salvation. It articulates a myriad of emotions, sadness, fear, desolation and alienation. However, his signature motif of a bold young boy has an ethereal quality, personifying his dreams of freedom, a tribute to his continual perseverance in life. 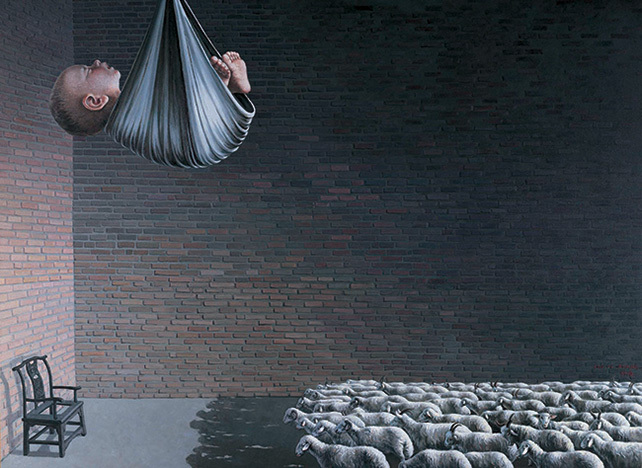 In some of his more recent works, the child is no longer the hero, instead replaced by an emblematic animal, composing a poetic introspective triggered by his dystopian view of society. Purely personal and highly politically charged, Zhang LinHai’s work is a hauntingly beautiful commentary of the struggles of inequality, poverty and loneliness, woven in with a strange feeling of nostalgia.